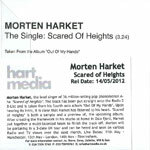 The second single from Morten's "Out Of My Hands" is "Scared Of Heights" and was released outside Norway on 30 March (UK on 10 April - changed to 14 May?). This is a physical 2-track release featuring the title track (3:26) plus the "Stockholm version" (3:29). This song is a cover version of Espen Lind's 2008 hit. The cover artwork features the same shot of Morten's head and arm emerging from the water as on the "Lightning" artwork, but it is printed in black and white and at an angle of around 45 degrees. "morten harket" and the title are printed in light blue and white respectively along the bottom of the sleeve. The back of the insert is black with titles in light blue and white. 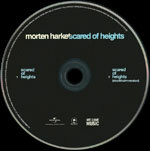 The disc is black with "morten harket" in white and "scared of heights" in light blue across the top. The tracks are listed in light blue on either side of the centre. Universal, Island and We Love Music record company logos are printed at the bottom of the disc in white. 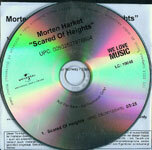 There is a UK 1-track promo of "Scared Of Heights". It comes in a PVC wallet sleeve with folded paper insert, printed on good quality paper. The front artwork is similar to the regular release. The back has titles in black including contact e-mail address and telephone number of Wrasse Records. The "Wrasse Records" logo in white, dark blue is printed on the left hand side. It features one track, "Scared Of Heights" (3.24). The disc is white with similar titles to the back sleeve. Some copies of the promo come with a "Release Date 14th May 2012" sticker with information about the album, 3 concert date and record company information. 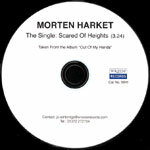 There is a German 1-track promo of "Scared Of Heights", released by Compass Point under exclusive licence to Universal Music. It comes with a double sided paper insert with black text. The disc is silver with black text including titles, Universal and We Love Music logos, promotional and publishing information, catalogue number track information.